Money was raised online via a crowdfunding website for materials to make the library, Techno’s Dad, a volunteer with the Countryside Rangers, was enlisted to build it, friends donated books of a wide variety of genres and Rangers dug an enormous hole and installed the sturdy pole and box. On Saturday afternoon a gathering of 36 folk, some far too young to read though others were readers of many decades, assembled at the Visitor Centre and set off in procession along the ridge line towards the library site. 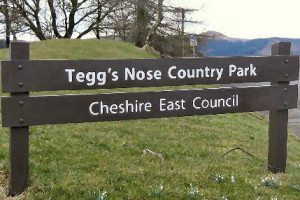 Tegg’s Nose stands at 380 metres /1247 feet above sea level – and it was dry but chilly. Snow still skulked in the hollows and in shady areas behind the dry stone walls. At first the walk route overlooks Macclesfield town. Then the path swings up old flagstone steps to the eastern side. In the distance is the darker smudge of Macclesfield Forest, with the pointed peak of Shutlingsloe (Cheshire’s “Matterhorn”) beyond. The group passed the old millstone grit quarry and its array of outdoor machinery. Below lies the sweep of the valley, with neatly demarcated fields and a reservoir. It was a twenty minute walk from the car park and Visitor Centre, but then many of the group had only little legs. We arrived above the Library but could not actually see it. Just past an inviting seat overlooking the slopes is a narrow path: this is the Goat Track which descends steeply to the valley bottom. But within fifty metres or so of the top of the Goat Track on a grassy terrace is another viewing seat – and the Library! There it was, bedecked with a red ribbon and overhung by bunting. A few short speeches preceded the untying of the ribbon – and the Library was declared Open! The eclectic mix of books proved attractive: several children seized a book of their choice and plonked themselves down on the idyllically situated bench. Books were borrowed for a read at home (return when you can or/and put other volumes in the box). 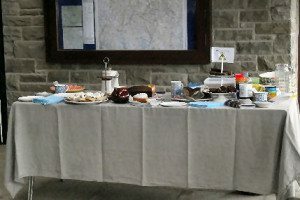 Guests were urged to sign the Visitors’ Book and then the group meandered back to the Visitor Centre where a wonderful spread of cakes, scones, biscuits and mugs of tea refreshed the walkers. 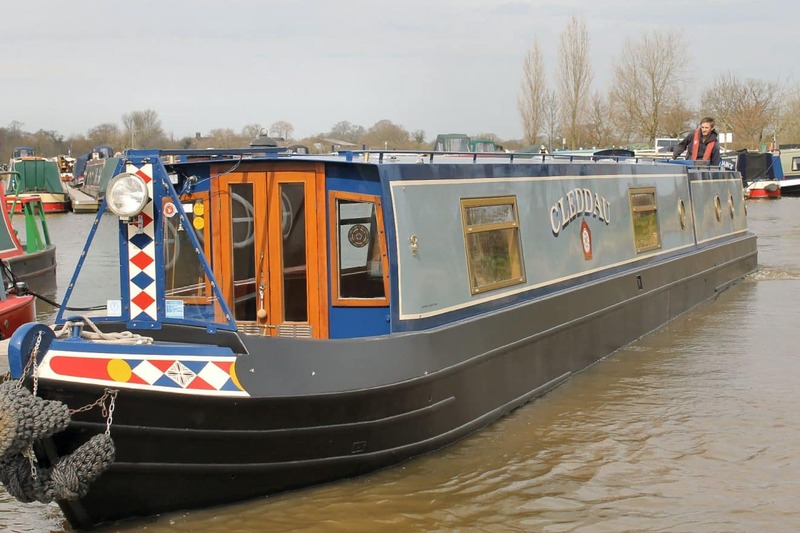 In all it was a most civilised and good humoured affair, a gathering to see an inspirational idea translated into reality. Seek it out if you can, the Library in a Landscape, at Tegg’s Nose Countryside Park, on Buxton Old Road, about 2 miles east and uphill of Macclesfield. Pick up a site leaflet: the map inside will help you find your way and check out the exact location on the large scale map on the wall in the Visitor Centre. See other photos about the construction and opening of the library on the facebook site. and then pop on up to Tegg’s Nose for some stunning views and a book browsing session!